FRESNO - Amidst the vast warehouse of Fowler Packing’s busy production line of Halos branded mandarins, City of Fresno Mayor Ashley Swearengin flanked by members of the Fresno Food Expo Advisory Committee, Union Bank, export advisors and San Joaquin Valley-based food producers announced open registration for the 2014 Fresno Food Expo presented by Union Bank, which will be held on July 24, 2014. Successful exporting deals with Japan, new co-packing relationships and national retailer wins – along with the return of the popular Fresno Food Expo New Product Awards, presented by Baker, Peterson & Franklin were announced. The Fresno Food Expo is the largest regional food show in the nation – open exclusively to food and beverage companies located in the 8-county San Joaquin Valley. The date shift from the show’s traditional time in March will provide greater inclusion of the 2,500+ fresh produce growers and packers in the San Joaquin Valley accounting for an economic impact of $113.4 billion in 2012 according to the California Department of Food and Agriculture and the San Joaquin Valley’s eight county Departments of Agriculture. The San Joaquin Valley represents over 69% of the commodities in California and is home to 7 of California’s top 10 Agricultural producing counties. Of the top 25 stone-fruit growers in the nation, 11 are located in the San Joaquin Valley including four Fresno Food Expo exhibitors – Gerawan Farming, Wawona Packing, Fowler Packing and Simonian Fruit Company. From large to small growers, established cooperatives and ethnic produce grown in the San Joaquin Valley – the increased number of fresh food producers for the 2014 Fresno Food Expo will complement the vast array of quality finished and value-add products that fill the show floor. Exhibitor participation has steadily increased in every category for the Fresno Food Expo each year, which speaks volumes to the value it brings to both small and large food companies. Over 2/3 of exhibitors who participated in 2013 were returning exhibitors and of those returning, 75% have said their sales have increased by at least 15%, on average, as a direct result of their participation in the Fresno Food Expo. The move to July will open a new category of buyers – both nationally and internationally – attending the show, creating new business opportunities and growth for the region’s economy. Since the launch of the Expo in 2011, buyer participation has increased by over 220% – with the 2013 Fresno Food Expo drawing in over 600 local, national and international buyers, 71% of which had the power to authorize purchases on the spot. Major retailers attending the show have been Costco, Save Mart Supermarkets, Whole Foods, Vallarta, Sam’s Club, Bristol Farms and Delaware North Companies – with Trader Joe’s and Kroger attending for the first time in 2013, along with international buyers from Canada, Pacific Rim, Mexico and Colombia, hosted by the Center for International Trade Development, State Center Community College District as part of their first organized buying mission tied to a regional food show. “The number and quality of buyers has significantly increased in just the three years of the show and strategic efforts are being dedicated to ensure this trend continues for 2014’s Expo. With the date change and increased exhibitor participation, we are looking at our buyer numbers to grow by 15% in 2014,” stated Swearengin. Leland Parnagian, with Fowler Packing Company in Fresno, CA, the third generation family-owned grower and packer of mandarins, table grapes and tree fruit under the Halos and SamSonS brands agrees. “A July Expo opens up a convenient opportunity for buyers to combine their traditional summer site tours with attending the Fresno Food Expo to experience what other new products and companies are out there,” said Parnagian. 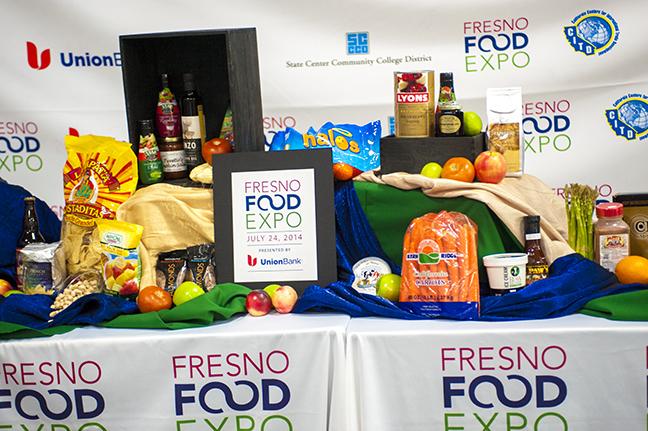 The Fresno Food Expo is more than just a trade show – it is a great platform for both buyer and industry connections that lead to new market opportunities, a perfect test market for new products, a showcase for food and packaging innovations and more. The 2014 Fresno Food Expo will bring new opportunities for growth in both buyer and exhibitor participation with an anticipated 140 exhibitors and 700 pre-registered, qualified buyers attending. The public portion of the Fresno Food Expo is anticipated to welcome 1,200 attendees, which inspires the region’s community to engage with the local food industry with continued support throughout the year by purchasing local products at grocery stores and in restaurants. Buyers and exhibitors may pre-register for the 2014 Fresno Food Expo to be held on Thursday, July 24, 2014 by visiting www.FresnoFoodExpo.com. Qualified buyer registration is free. Exhibitors can take advantage of early bird discounts, a 40% savings, through February 15, with public ticket sales launching in the spring. A platform to highlight innovative new products and trends in the food industry, the Fresno Food Expo New Product Awards, presented by Baker, Peterson & Franklin, has provided additional exposure to companies like Rosa Brothers Milk Company, Bella Viva Orchards and Valley Spirits, all 2013 winners. The Fresno Food Expo New Product Awards will return in 2014 with the category of “Buyers Choice.” Eligible companies must have a new food or beverage product or packaging that has or will be introduced to the market between March 15, 2013 and July 24, 2014 to participate. Applications are available at http://fresnofoodexpo.com/content/expo/new-product-awards. 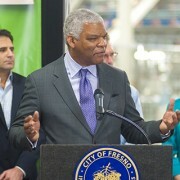 The Fresno Food Expo was first developed in 2011 as part of the City of Fresno’s economic development strategy under Mayor Ashley Swearengin to find innovative ways to help local companies grow their business; specifically export oriented businesses that bring in new dollars to the Valley’s economy. Since its launch, the Fresno Food Expo has provided a platform for Valley-based food and beverage producers to network, share industry relationships, create new business contacts and increase their exposure to broaden their markets and increase sales opportunities by introducing local food producers with key buyers from international, domestic, regional and local food and beverage buying channels.